October 18, 2011 (Abrams, WI)–The Off Road Championship’s season finale took place this past weekend at Cycle Ranch in Floresville, not far from San Antonio, Texas. The red dirt of the converted motocross track proved it was not used to 4 wheels because a lot of trucks were bicycling the entire weekend–making for some very exciting racing. Johnny Greaves came into the weekend clinging to a narrow 4 point lead over Ricky Johnson in the Pro-4 class and eager to take home another championship. CJ and Marty, both wrapping up their first year in the Pro Light and Pro 2WD class respectively, were hoping to have good races to build on for next season. The championship would elude Johnny. Ricky Johnson and Johnny started on the front row for the first race and battled nose to tail for a classic JG/RJ battle the entire race. Johnny passed RJ to go for the bonus points for leading at the midway point of the race. But RJ passed him back in the next turn to collect the points. Greaves finished 2nd rendering them dead even in the points. Post race, Johnny was feeling good about his chances for Sunday having pulled the fastest lap time, earning his 5th Oakley Bomb Award for Monster Energy/ ReadyLift/ GearUp2Go.com/ Maxxis Tire and Toyota. Sunday, the 9 time champion Greaves ran strong up front. He tried to pass the front running Scott Douglas while fending off RJ who was hot on his tail. All three made contact and Johnny emerged in the lead but began to feel a vibration in the front-end. Exiting the whoop section turn, the front drive broke. It would eventually lock-up completely and Johnny had to pull out of the race, ending his chances for the championship but landing him in the very respectable runner-up position for the season standings. Marty Hart started on row 2 and stayed in the top 3 most of the race. Two laps from the end, Marty’s Monster Energy/ ReadyLift/ GearUp2Go.com/ Maxxis Tire/ Toyota went up on 2 wheels. He was able to save it but Greg Adler was able to take advantage and scoot by him to take third. He finished a strong 4th, just off the podium. He had a strong start in Sunday’s race–again running in the top 3–battling Bryce Menzies and Rob MacCachren the entire race. With only 2 turns remaining in the race, Marty lost his rear gear and lost several positions, winding up in 6th. CJ Greaves started 6th in the Pro Light race on Saturday. After an early race roll-over, he made an impressive charge from the back to the front in the first half of the race. Then, he caught a rut and bicycled in the second half of the race that sent him to the rear of the pack once again. He made another remarkable charge to the front and passed Casey Currie on the last lap to claim the 3rd place spot on the podium. He also landed a 3rd place finish in Sunday’s race. 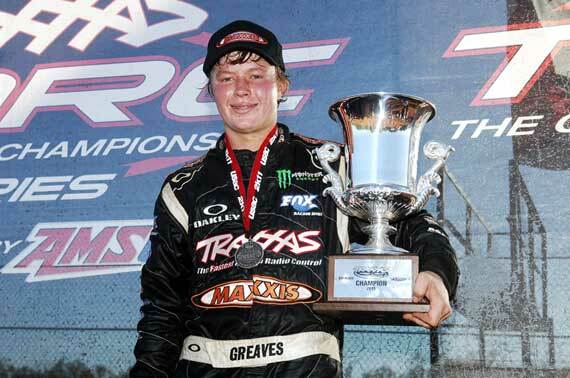 At one point the younger Greaves led the race and had exciting battles with R.J. Anderson for first and second. He eventually bicycled but he recovered to claim the third place podium spot. The highlight of the weekend was CJ Greaves taking his Traxxas/ Monster Energy/ Maxxis/ Oakley/ Toyota to the top spot in the inaugural Traxxas Pro Light Cup race. As if the $15,000 prize was not enough, CJ was motivated to show the Pro Light class that he was a force to be dealt with. He diced it up with the top drivers, eventually passing defending Pro Light driver Casey Currie to take over the lead. Currie had a flat tire late in the race that opened the door for CJ to get the win. His name will be the first etched into the trophy as well as the youngest driver to win a Pro Light race at the age of 16. The team packed up the haulers feeling like they had represented their sponsors and fans well this season. Johnny, Marty, CJ Podium at Route 66 Raceway, Johnny Clings to Narrow Points Lead, CJ Clinches Back-to-Back Super Buggy Championship! Abrams, WI (Sept 19, 2011)—The Off Road Championship headed to the Route 66 Raceway at Chicagoland Speedway, in Joliet, IL for a rare midweek race on September 14th and 15th. The Wednesday evening race was streamed live on USAC’s USTREAM channel while the Thursday race was broadcast live on SPEED TV. CJ strapped into his Pro Light truck first on Wednesday evening for the under the lights race. CJ found himself in the lead early, but problems by Casey Currie stopped the race. When the green flag flew once again, CJ powered ahead to maintain his lead for the next 4 or 5 laps with RJ Anderson on his bumper in 2nd and Brad Lovell in 3rd feeling pressure from Sam Hubinette. Anderson got a run on CJ and passed him heading into the back stretch. Greaves and Anderson pulled away from the field and CJ wisely backed off to save his truck for the second half of the race. Lovell would eventually role his truck as did Hubinette just as he crossed the start/finish line to take the mandatory caution at the midway point. Andrew Caddell got a great restart and pushed past CJ to take over 2nd. The top 3 ran bumper to bumper until the end of the race. CJ and Caddell went side-by-side but Caddell prevailed. On the white flag lap, Shawn Morris had a vicious role-over bringing out a full-course caution. At first it looked like it would be a green/white restart, but USAC changed it to a yellow/checkered flag—ending the race in the order prior to the caution—RJ Anderson, followed by Caddell, and CJ landing his 3rd podium of the year. Marty Hart lined up on the 3rd row for the Pro2 race. He was able to push his way up to 3rd when several of the front runners tangled up on the back stretch on the first lap–including Rob MacCachren, Jeff Kincaid and Mikey Vanden Heuvel. Marty worked his way around Chad Hord and set his sights on Bryce Menzies. Bryce slowed on the back stretch with some type of mechanical problem and Marty shot ahead to the lead which he held through the competition caution. With MacCachren and Taylor out of the race and Bryce Menzies limping around, there were only 7 trucks left in the race in the closing laps. On the restart, Marty held his lead. Meanwhile, Jeff Kincaid passed Hord for 2nd. One lap after the restart, Mike Oberg got into Hord who rolled hard and landed on his roof, bringing out a full-course caution and putting the last of the top 3 points leaders out of the race. When racing resumed, Marty worked hard to stay in the lead, but Jeff Kincaid was able to pass him in the air at the infield tabletop jump. Marty Hart took the checkered flag in 2nd for his highest position of the year. The Pro-4’s were up next. Johnny Greaves came into rounds 11 and 12 clinging to a narrow 15 point lead. 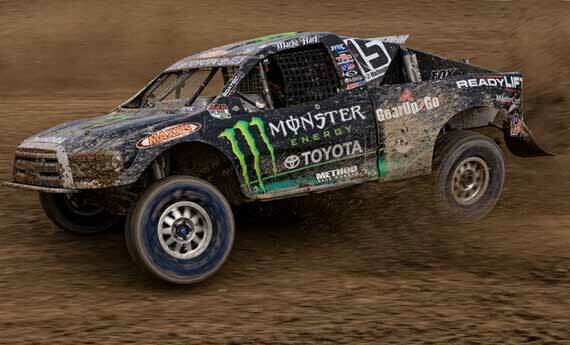 With only 4 races left in the 2011 TORC series season, each race put the championship on the line. The points leaders started on the front row with Johnny on the outside and Ricky Johnson on the inside. When the green flag flew, Johnny went to the lead. But, the race was called back by USAC for a false start. This time, RJ beat the field to turn one for the lead followed by Johnny, then Adrian Cennie. The top 3 pulled away from the other trucks but kept a safe distance between each other. On about lap 5, Johnny hit the tabletop jump and landed hard, dislodging his hood. Driving blind, he had to pull into the hot pit for the crew to quickly pull the hood off. At the competition caution, Greaves pulled into the hot pit a second time to remove more dangling Boatec fiberglass from his vision. On the restart, Mark Jenkins jumped the green flag twice. Once racing finally got underway, Johnny began to work his way back to the front. With 3 laps to go, Johnny squeezed his Monster Energy Toyota between the 3rd and 4th place running Scott Douglas and Steve Barlow to take over 3rd place where he finished the race. Johnny also earned his Oakley Bomb Award for the fastest lap. The Pro Lights rolled off first on Thursday night with CJ starting his Traxxas/ Monster Energy/ Maxxis/ Oakley/Toyota in the 5th position and moved up one spot before the competition caution. CJ was looking great in the second half of the race. He maneuvered around the 2nd and 3rd place vehicles to battle RJ Anderson for the lead which CJ was able to take with about 4 laps to go in the race. But RJ was able to win it back. With a couple of laps left, CJ made an inside move on Anderson to go for the lead. When he did, he clipped one of the tractor tire barriers and rolled his truck. Fortunately he landed on all-4’s. The impact however broke a spindle and he had to limp to the finish line—winding up a disappointing 9th. In the Pro-2 class, Marty Hart was looking great at the beginning of the race. After having started 6th, he worked his way up into the top 3 leading up to the midway caution. Not willing to settle for 3rd, Marty stuck the nose of his Monster Energy/ ReadyLift/ GearUp2Go.com/ Maxxis Tire and Toyota on the outside of Chad Hord to challenge for 2nd. When he did, he clipped the wall which damaged his steering. He continued on in the race and finished an impressive 5th, despite his ill handling truck. The Pro-4 race was a classic battle between Johnny and Ricky Johnson—reminiscent of the battles he used to have with fellow Monster Energy racer, Rick Huseman. Johnny confessed he played it a little too safe at first. He lead a good portion of the race but RJ was able to make as pass on Johnny after he, like Marty, developed some steering issues. Johnny took his red plated number 22 to the runner up podium position and maintained his points lead in the process—but by a narrow 4 point margin, setting up a showdown for the championship on the final race weekend at Cycle Ranch in San Antonio, TX. Greaves racing didn’t have any time to rest. They headed to Oshkosh, Wisconsin, for the final Sportsman race of the season for CJ in the Super Buggy class. CJ hoped to wrap up his bid for a back-to-back championship in only his second year racing. He did that with flying colors by going 3-for-3 for Traxxas/ Monster Energy/Maxxis/Oakley. He actually clinched the championship by taking the green flag in the 2nd race. The 3 victories were icing on the cake—he finished all but one race on the podium this season—and clinched by a whopping 64 points. The Traxxas TORC Series will wrap up its season on October 15-16 at Cycle Ranch near San Antonio, Texas. It should prove to be a very exciting weekend with Johnny shooting for another off-road championship to his legendary racing career. Abrams, WI (September 13, 2011)—10’s of thousands of crazed off-road racing fans made their annual pilgrimage to fabled Crandon International Raceway for the Brush Run Races that have been held there for more than 50 years. With the pit area packed with people and the festive atmosphere, Johnny Greaves Motorsports tried to stay focused on race preparation that would include a make-up round on Friday from the first Crandon race. Rain would again be a threat, but the famed track crew of Crandon kept the track in good racing condition the entire weekend. When the long Labor Day weekend ended, Johnny had a pair of second place finishes, a 3rd in the Amsoil Cup, and grabbed the Pro 4×4 points lead; Marty had earned his first podium with a third place finish on Friday; CJ took a commanding points lead in the Super Buggy with 1st-2nd-4th place finishes and showed a lot of strength in the Pro Light class. Friday’s make-up for round 4 added additional pressure to the team for the weekend. With 4 races looming, Johnny was determined to make sure his Monster Energy/ ReadyLift/ GearUp2Go.com/ Maxxis Tire and Toyota Pro-4 lasted the entire weekend. Adrian Cenni led the entire race with Johnny in 2nd. Adrian is not in the points race, so Johnny tried to be smart and settled for second with Ricky Johnson in third. Marty Hart worked his way up to 5th place in the Pro 2WD class. CJ was running in 5th in his Traxxas/ Monster Energy/Maxxis/Oakley Pro Light Toyota when he overheated and had to pull out of the race. In the Super Buggy, he finished 2nd in a photo finish. Saturday, the Pro 4 race was almost identical to the Friday race. Johnny won the hole shot and lead through the competition caution. Cenni, however, was able to pass Johnny for the lead. Johnny didn’t want to be too aggressive with Cenni since he was not in the points race. trailed Adrian Cenni through the entire race and finished 2nd with Ricky Johnson finishing in 3rd as dark clouds and rain approached the track. Marty made it safely through the turn-1 hole shot and worked his way up to 7th place at the competition caution. He made a great inside move in the gravel pit turn to pick off several more positions, ending up in 4th. As he charged forward, the leader, Jeff Kincaid, pulled out of the race, instantly moving Marty’s black Monster Energy number 15 Toyota into 3rd just behind Chad Hord. He ran a clean, smart Pro 2WD race and garnered his first podium of the year with a 3rd place finish! CJ’s luck in the Pro Light did not fair any better on Saturday. He had a bad start but meticulously worked his way through the field but suffered a mechanical problem just after the caution and could not finish the race. What are the odds of having a second photo finish in the same weekend? That was the case for CJ in the Super Buggy race. He crossed the line just a head of the 3rd place running Bob Klaus, but due to transponder placement, had to settle for 4th place, just off the podium. Saturday evening, the rain fell and turned the track into solid mud. However, the track crews worked very hard and the track was in fairly good condition with some muddy patches for Sunday’s showdown. In the Pro-4 race, Ricky Johnson suffered mechanical problems early and had to pull out of the race. Johnny was looking good in 3rd place behind Cenni, running in 1st followed by Steve Barlow with Scott Douglas behind Johnny in 4th. Steve Barlow spun out in the gravel pit turn and collected Johnny in the process. Scott Douglas, unable to check-up, ran hard into Johnny, pushing him well off the track–resulting in a flat tire and a bent tie rod. Johnny was able to re-fire and made the long journey around the track to the hot pit, where he made the tire change. He was able to continue the race well off the pace, but salvaged valuable points finishing in 6th. He finished the weekend with a 15 point lead in the standings over Ricky Johnson. The Pro-2 race was a mud race with basically one racing line. Marty Hart worked his way up to as high as 2nd but got out of the dry groove and into the slick stuff. He went over the berm and stuck in the mud. By the time the track crew was able to free him, he was too far back. He ended the race in 8th place. After a bad start, CJ worked his way through the field of 20 trucks and was looking very strong in the Pro Light race. He was 8th at the mandatory caution. On the restart, he charged ahead, working his way into the top five. He was going for 3rd when another truck got into him in off of one of the jumps. The contact popped his tire. Unable to control the truck when he hit the ground, he slid into the wall, ending his day. CJ would finally have a reason to celebrate when he took his turn in the Super Buggy class. He had a great start and stayed out front the entire race–finishing in 1st place. His weekend propelled him to a whopping 22 point lead with only 2 races left in the season. The highly anticipated Amsoil Cup race pits Pro-4’s against Pro-2’s. The Pro-2’s were given a 15 second lead over their 4-wheel drive counterparts. The Pro-4’s all but took each other out of the competition with a big pileup early in the race. By the time the few that could continue got underway, the Pro-2’s had too large a lead to overcome. Johnny was making up ground but ran out of time. He finished 3rd behind Scott Douglas and a well deserving Pro-2 driver, Chad Hord. Johnny G Motorsports will make the quick turn-around and head to Chicagoland Speedway in Joliet, IL for rounds 11 and 12 next week. Round 12 of the TRAXXAS TORC Series, will be broadcast LIVE on SPEED Channel this coming Thursday, September 15, from 9-11pm EST! Johnny, Marty and CJ will have a chance to show their stuff in front of a live audience. The action will kick-off on Wednesday for round 11. Abrams, WI (August 15, 2011)—The Monster Energy/Toyota/Maxxis team of Johnny Greaves, Marty Hart, and CJ Greaves headed to the familiar territory of Bark River International Raceway this past weekend for rounds 7 and 8 of the TORC Series. Johnny, Marty and CJ have all enjoyed a lot of success at this track located in the Upper Peninsula of Mich. There will only be one race held at Bark River this year so the G-Team was revved-up and ready to take on their respective classes. The record crowd witnessed some exciting racing as well as some ugly incidents on and off the track. Johnny Greaves ended the weekend with a win on Saturday and a controversial 5th place on Sunday. He took a couple of Oakley Bomb awards, breaking the track record in the process. Marty would have his best showing with a 4th place finish on Saturday. Sunday he led a good portion of the race only to be involved in a freakish crash with the front running Chad Hord. CJ Greaves dominated the Super Buggy class with 2 wins and a 2nd place on the weekend. In his Pro Light program, he podiumed for the second time this year in the Sunday race with a 3rd place finish. On Saturday, CJ was up first in the Super Buggy class. The first race was a make-up race. CJ dominated from green flag to checkered flag and took the win by a mile. His luck was not so good in the Pro Light Truck race. He worked his way up to 7th after starting from the back row of the grid due to a motor change. Unfortunately, he blew a tire and had to pit as the field went to yellow for the competition caution. The crew did a quick tire change and got him back out on the lead lap but had to work his way from dead last once again. He worked hard making a lot of passes and mustered a 9th place finish for Traxxas/ Monster Energy/Maxxis/Oakley/Toyota. Up next was Marty Hart in the Pro 2WD class. Marty started on the front row and had a great start by winning the hole shot, and the lead. 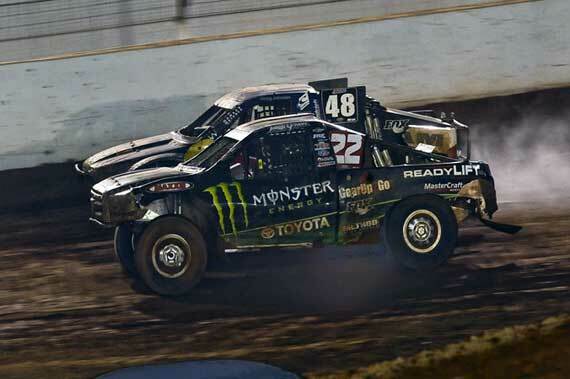 He was looking impressive as he led lap one in his Monster Energy/ ReadyLift/ GearUp2Go.com/ Maxxis Tire Toyota. The top 3 trucks began to pull away from the field with Marty leading and stretching it into lap 2 with Bryce Menzies and Jeff Kincaid in tow. On lap 3, Menzie hit Marty in the air off the RB jump allowing Bryce and Kincaid to pass him for the top 2 spots. At the restart following the competition caution, Marty did not get a good start. Both Chad Hord and Scott Taylor passed Hart sending him to 5th. Marty battled with Taylor and was able to pass him to finish 4th. The third place running Chad Hord began to experience mechanical problems with the finish line just a few turns away. However, he was able to hold on to third pushing Marty just off the podium but completed his best run of the season. The regularly scheduled Super Buggy race was next. CJ hoped to capitalize on his win earlier in the day. Starting from the third row, he pushed hard through turn one of the rolling start, making it safely through and into third. When the leader spun-out, the top 2 racers- Steve Krieman and CJ Greaves were able to pull away to a huge margin over the rest of the field leading up to the competition caution. On the restart, CJ made a great outside, inside move on Krieman to make the pass for the lead. Larry Job also passed Krieman into second as Krieman’s vehicle began to develop problems. CJ and Job were 4 or 5 turns from the field when the final lap came around. Job tried several desperate attempts to get around the Monster Energy/Maxxis/Oakley sponsored buggy of Greaves but was unable to get in done. CJ cruised on for his 2nd win of the day. The much anticipated Pro 4×4 race was up next. With the foofaraw from Charlotte still fresh in the minds of everyone, the Pro 4×4 race was sure to be an exciting one. Ricky Johnson won the hole shot but Johnny was right on his bumper. The two pulled away from the rest of the field and it was as if they were one truck all the way to the competition caution with Johnny pulling along side RJ several times. On the restart, just about all the trucks made contact with each other as they attempted to get the nose of their truck out front first. Johnny and RJ collided in mid air as they came around the horseshoe turn. As Johnny’s momentum slowed, Mike Jenkins was able to take advantage and move into the lead. Scott Douglas was on the inside of Johnny as he poured the coals to his Tundra’s 4 Maxxis tires to get back up to speed. Meanwhile, Ricky Johnson’s truck pulled off the track with a flat and possibly mechanical issues. By lap 8, Johnny used his favorite passing lane in Cemetery turn to get around Jenkins to take the lead. Sunday’s racing was equally as exciting. Up first was CJ Greaves in his Pro Light truck. CJ had a great start and went in and out of the top 5 through the first half of the race. He wound up in the top 4th at the competition caution. With only a few laps remaining, he passed Brad Lovell to take over the 3rd spot. He set his sites on the front runners but ran out of time and settled for the impressive 3rd place finish–his second podium of the year. The Pro 2WD race was wild and crazy. Marty Hart started from the pole position. When the green flag flew, Marty charged to the horseshoe turn hole-shot, exiting the turn in first place. Scott Taylor lost control and went over the k-rail. Hart checked out and was looking very strong leading the entire first half of the race. On the restart, Marty’s Toyota/Maxxis combination won the hole-shot once again with Chad Hord mixing it up behind him with Bryce Menzies. Chad passed Bryce and was able to overtake and pass Marty. As they entered the Cemetery turn, Chad slammed into the outside barrier, careened back into the path of Hart’s machine, which crashed full speed into the side of Hord, then Menzies ran into them as they both were in the middle of the track. The crash took Marty out of a race that looked very promising for him. CJ continued his success in the Super Buggy on Sunday with a second place finish. He sits firmly atop the points standing in first, 11 points ahead of the next competitor. CJ has either won or had a second place in every buggy race thus far this season. The Pro 4×4 race featured the same type of mayhem as the Pro-2. Johnny dominated all but the last lap of the race. With the checkered flag in site and one more turn to take, it looked like Johnny Greaves would win his second race of the weekend over Ricky Johnson. However, Ricky aggressively hit Johnny in the side, turning him hard into the outside k-rail, taking him out of the race. RJ went on to win but was accessed a points penalty that amounted to a slap on the wrist for his rough driving. Johnny’s Toyota was the fastest truck on the track earning him his second Oakley Bomb Award of the weekend. When the dust settled and USAC had made their ruling and the points tallied, Johnny and RJ were tied for first place in the standings with 135 points each. 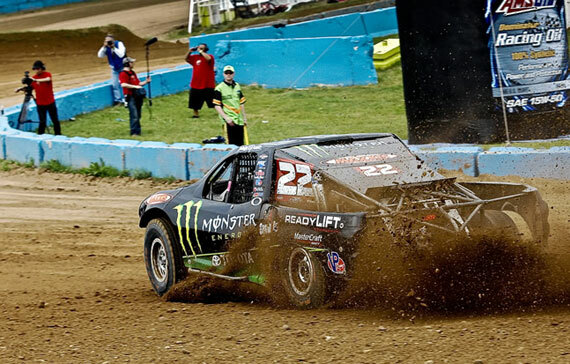 Crandon International Raceway is the next stop for The Off Road Championship series on Labor Day weekend, September 3rd-4th. 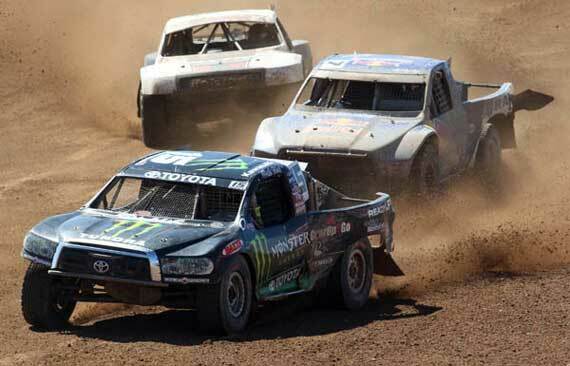 These crucial make-or-break races are sure to provide a lot of excitement for the 10’s of thousand that make their annual pilgrimage to Crandon. Abrams, WI (July 24, 2011)—The Off Road Championship took the short-course off-road racing experience to the Eastern side of the U.S., to Charlotte Motor Speedway’s dirt track this past Friday and Saturday night. The NASCAR stomping ground was converted to whoops, jumps and rhythm section, all crammed inside of a half-mile oval. The pro class teams made their way to the east coast to introduce this sport to racing fans in the South, where oval dirt tracks and NASCAR are a way of life. Those that attended were blown away by this high-powered sport and wished more people could have had the same experience. Johnny would get his second win of the season on Saturday night in an epic battle with Ricky Johnson. The Friday night races were unkind to the entire Greaves team. CJ Greaves broke a rear wheel hub due to contact in the early goings while trying to work his way to the front. He exited the race around lap 5. Marty started up front, but would also break early, losing his drive shaft due to the rough track. Johnny had issues too. He had a great start and battled up front all the way through 2 laps after the mid-race competition caution only to have his transmission, losing 1st, 2nd and 3rd gear. He finished the race however, salvaging as many points as possible. The team regrouped for Saturday night’s races. The southern humidity was something the teams were not use to. But they worked through the night to get the trucks ready. CJ, worked his way up to 4th in his Traxxas/ Monster Energy/Maxxis/Oakley Pro Light Toyota. He hit one of the jumps wrong and landed hard, digging his skid plate into the Charlotte dirt. CJ thought he had broken something and pulled into the pit. By the time the team figured out that there was no problem, he had lost too many positions and ended the race in 9th. Marty Hart decided to take a more cautious approach to the Pro 2WD class race on Saturday in order to get more time in the seat and learn the truck. This is his first year in this class. He worked hard, concentrating on clean passes and smooth lines resulting in his second top 5 of the year. 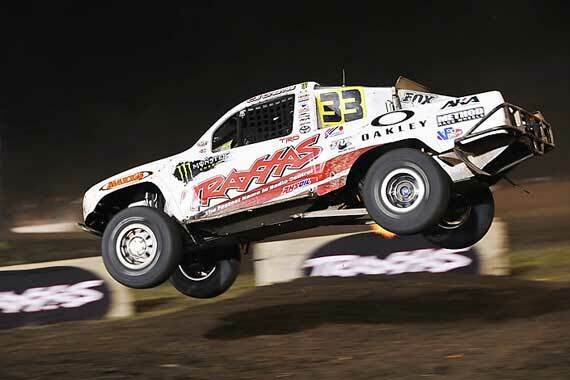 The race the fans will be talking about for some time came on Saturday evening between defending champ, Johnny Greaves, and Pro 2WD convert, Ricky Johnson as they battled door-to-door just about the entire race in their Pro-4, 4-wheel drive trucks. For the two-by-two rolling start, Johnny started his Monster Energy/ ReadyLift/ GearUp2Go.com/ Maxxis Tire Toyota from row 2. Mike Jenkins took the lead from the front row with Johnny right on his bumper. Jenkins pulled off the track before the end of lap 1 moving Greaves’ Toyota into the top spot with Ricky Johnson not far behind. Johnny led the first 4 or 5 laps. Ricky began to bang on Johnny so Greaves wisely gave up the lead to save the truck for the final laps. With about 7 laps to go, Johnny made a made a great inside move on RJ to take over the lead and extended the lead on the back stretch. The two went head-to-head with each exchanging the lead several times. Ricky was in the lead on when the white flag flew but was showing signs of weakness, getting loose and his truck was smoking. Johnny made the inside move stick and passed RJ for the lead in the whoops. RJ was not done though; he made several attempts to get around Johnny, even almost landing on top of him in the infield jumps. He also made serious contact on the final turn, but Johnny was able to hold on and power ahead for the victory! Following the race end, tempers flared and RJ made some moves towards the younger Greaves: CJ. It was all great drama for television but was not very sportsmanlike. Greaves Motorsports will head back to the Mid-west when the TORC series resumes at Bark River International Raceway on August 13th and 14th. Johnny, Marty and CJ have all had great success at this sprawling track that features the Monster Energy jump. It should be exciting. Abrams, WI (July 11, 2011)—The Off Road Championship (TORC) Series Sportsman class headed to Antigo, WI, located just south of Crandon for rounds 5 and 6 this past weekend. TORC also planned to make-up the rounds 1 and 2 races from Red Bud, MI, which were rained out. These races were slated for Sunday, but they were once again postponed due to rain. CJ Greaves, the defending Super Buggy Champion, was looking to improve on his second place finish in the only Super Buggy race at Crandon. He squeezed out another second place podium spot on Saturday and hit the top spot on Sunday for his first win of the season. He narrowed the points gap between he and front runner, Larry Job, to a 1 point margin. In the Sunday race, CJ and Job started on the back row due to an inversion based on points. CJ drove his number 33 Traxxas/ Monster Energy/Maxxis/Oakley sponsored buggy through the field along with Job to the front in just a couple laps. They tandem caught John Frana, who had started from the pole position. At the competition caution, it was Frana, Job and CJ leading the pack. As the three racers pulled away from the field by a sizable margin, Frana lost a wheel that took him out of the competition. CJ tried to no avail to pass Job and settled for the runner-up podium position. Sunday’s race featured a repeat performance of the Saturday race. CJ and Job, starting from the back once again, went straight to the front when the green flag flew. This time, it was Job who was in the lead following the competition caution. Frana and CJ battled back and forth for the number 2 position and hoping Job would make a mistake to give them a chance to lead the race. The opportunity came when Job over rotated his machine and broke something in the transmission. Frana, in second, and CJ in third at the time, passed Job who continued to fall back, all the way to the fifth spot. With only 2 laps remaining in the race, John Frana, driving the only 4-wheel drive vehicle on the track, blew his motor, taking him out of the race for the second time of the weekend. Frana’s bad luck turned into CJ’s good luck as it sent him to the top of the podium for his first win of the season. Job limped in for a 5th place finish, salvaging a lot of points, but not until Greaves pulled within 1 point in the standings. The plans for the Red Bud make-up races were dashed when a rain shower muddied the track. Later, however, the track did dry up considerably, almost good enough to have the races. By then, the race had been canceled. The Pro Light drivers were given the opportunity to have an exhibition race. This gave the teams a chance to test their machines and get in some valuable seat time. CJ lead the pack the entire race and took the win. No points were gained, but it was a great confidence builder and a little more experience for CJ behind the wheel of the V8 Traxxas/ Monster Energy/ Maxxis/ Oakley Pro Light truck. This is his first year racing in this class and has already made his presence known and sits 3rd in the points. The next sportsman class races will be a Bark River, MI, on August 13th and 14th. Check out the latest photos and videos on the team website: JohnnyGreaves.com and on Facebook. 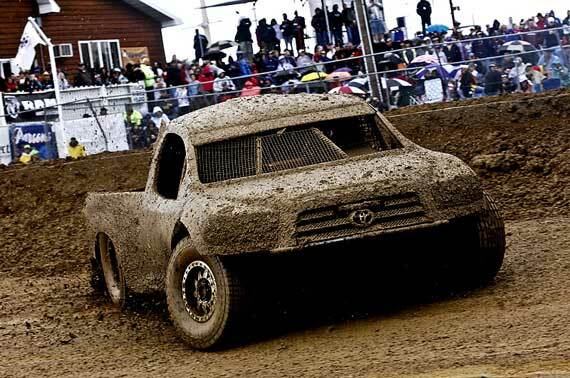 Abrams, WI (June 20, 2011)—Anxious to head to more familiar territory and a dryer track, Johnny Greaves motorsports knocked the mud and frustration off of their respective trucks and stormed into Crandon International Raceway this past Father’s Day weekend. After rain earlier in the week, the track crews worked hard and had the track in near perfect racing condition for qualifying on Friday. But with gray skies looming, everyone was hoping to get Saturday’s race underway, unencumbered by the extra weight of mud. A man building a large wooden boat near the track with animals lined up by it didn’t help the feelings of the Crandon faithful. When the dust settled on Saturday, Johnny had broken the Pro-4 track record and claimed his first victory of the season for Monster Energy/ ReadyLift/ GearUp2Go.com/ Maxxis Tire and Toyota as well as the Oakley Bomb Award. This was Maxxis Tires first Pro-4 win, proving they are a force to contend with in the Pro-4 class. Unfortunately, Sunday’s race had to be canceled due to rain. 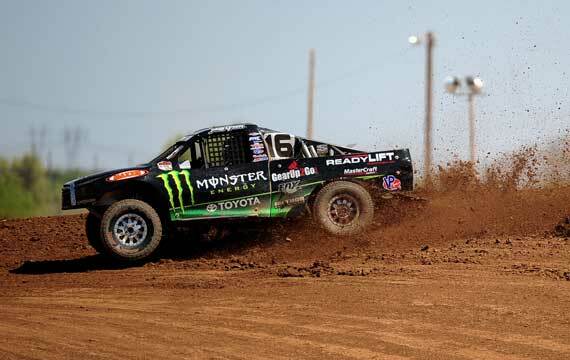 Johnny lined up 3rd and poured the coals to his Monster Energy Toyota on the land rush start—reaching a speed of nearly 100mph as the field hit the famous Potawatomi turn one. Johnny won the holeshot and pulled away to a 4 or 5 car lead. He bicycled the Tundra in the gravel pit turn but managed to save it, losing only 1 position to Adrian Cenni. Cenni’s lead was short lived as Johnny regained the lead in the argon turn section. Greaves powered his red-plated number 22 Toyota to a comfortable lead following the competition caution to cruse to victory lane. Marty Hart qualified his Maxxis Tire clad Toyota Pro-2 to a commanding pole position. He emerged from the turn one hole shot in second and was looking strong behind Rob MacCachren. On lap two, he cut a tire down and had to pit before the midway caution. This put him a lap down and out of contention. Even though he was a lap down, he ran close with the top five throughout the remainder of the race. CJ Greaves, racing both the Super Buggy and Pro Light classes, strapped in his buggy to defend his 2010 championship for the first time this season. He went side-by-side through turn 1 with Larry Job and settled in to the second place position through lap 1. On lap 2, he knocked most of the air out of his front tire. In spite of the low tire, he managed to hang tight with the leader. As the front 2 pulled away from the field, the race wound down to 2 laps. Some early race contact took its toll on his tires and he suffered a right rear flat. Incredibly, he held on to take the second place podium spot! Fresh off his outstanding showing at Red Bud, CJ proceeded to claim his first pole position in his Traxxas/ Monster Energy/Maxxis/Oakley Pro Light Toyota. From the pole position, he thought he had reached turn one in good shape after the land rush start, but not so. He was collected in a multi-truck crash when Luke Johnson lost control of his machine. The mayhem brought out the red flag and a complete restart of the race. With a broken tie-rod, CJ’s was toed back to the pit area. In order to allow the toe-truck to drop CJ’s truck, the team used a jack to catch the truck from the hook. Officials thought the team had worked on their truck during the red flag and put CJ on the back row for the restart. With just about the entire field in front of him, CJ patiently worked his way back up to the 6th. He tried hard to get around the very wide machine of Todd Cunningham but couldn’t make it happen. He settled for the 6th place, important in the points standing which tightened up considerably following the weekend. CJ is now sitting third in the points. The team will head to the eastern seaboard for the first time in the sports history to Charlotte Motor Speedway for rounds 5 and 6 of the Traxxas TORC Series. The race is slated for July 22-23 in Concord, NC. Abrams, WI (May 31, 2011)—Johnny and CJ Greaves excited about defending their championships and Marty Hart, the 2010 Lucas Series Pro Lite Unlimited champion ready to move up to the Pro-2 class, all headed to Red Bud MX park to kick-off the 2011 TORC Series season this past weekend. Mother Nature did not cooperate however and dealt the series, the fans and the drivers a soggy blow as multiple storms rolled across the southern tip of Lake Michigan the entire weekend. This included tornado warnings and heavy downpours that rendered the track and grounds into a muddy mess. Safety became an issue in the muddy conditions since the safety crews could not get to stuck or crashed vehicles. TORC/USAC officials looked high and low for ways to get the races in and in the process, made a few calls that added to the confusion. 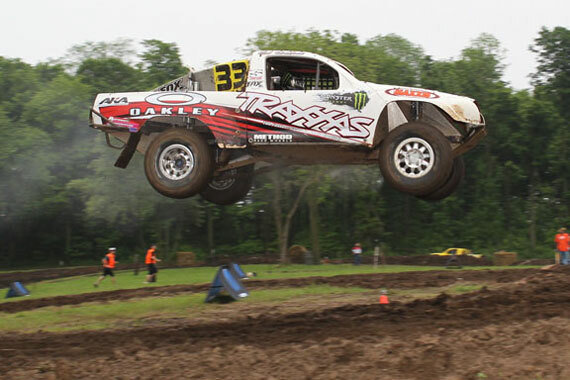 The Pro Light Truck class was able to get in two races, but the Pro-4’s and Pro-2’s had to settle for one race each. CJ Greaves, the defending Super Buggy champ in his first Pro Light racing weekend, showed everybody that he is a contender in whatever he is driving. As soon as the green flag flew, CJ took his Traxxas/ Monster Energy/Maxxis/Oakley Toyota to the lead and held it through the mandatory caution in the Sunday race. Veteran racer, Samuel Hubinette, in his first TORC series race, discovered that the younger Greaves knew where the good lines were. He began to follow CJ’s lead and eventually began to catch up to him. With about 3 laps remaining, Hubinette passed Greaves while the yellow flag was flying. Officials moved him back a spot but he was able to move back around him on the restart. The two exchanged leads a couple more times with Hubinette holding the top spot on the last lap. With the white flag flying, CJ had a run on Hubinette as they charged down the hill. Unfortunately, CJ had to check-up due to a yellow flag at the bottom of the hill, breaking his momentum and his opportunity to get back around Samuel for the win. CJ would land the 2nd place podium spot in his first Pro Light race. Hubinette was surprised that the fierce competitor that he had battled with was a teenager. CJ’s truck was running hot the entire race and actually caught on fire while at the podium. Saturday, CJ would kick-off his Pro Light career starting dead last due to his rookie status. He wasted no time proving that he was not interested in a learning curve. He passed the entire field, including defending class champion, Casey Currie, to move into second place by lap number 2. It was not without problems though. He got rear-ended on the start that damaged his radiator. The truck ran hot the rest of the race. Just ahead of the midway competition caution, Casey was able to get back around CJ. CJ landed wrong and … Taking advantage of the caution, CJ pulled into the hot pit for a tire change which put him at the rear of the field once again. The Toyota truck showed its resilience and held together to the end of the race in spite of running without water in the radiator. CJ was able to make it up to the 8th position before race end out of 16 competitors. With a muddy track, no practice, or even a chance to hit the jumps and whoops with speed, the Pro-4 trucks took to the track for the first time behind the pace truck. Carrying an extra 400 pounds of mud and starting from the 4th row, Johnny pushed his Monster Energy/ ReadyLift/ GearUp2Go.com/ Maxxis Tire clad Toyota up into the lead on the first lap. Not knowing how much speed to carry into the step-up jump, he landed at the top of the hill and the truck would not turn and slid into the mud bank. Steve Barlow did the exact same thing on the other side of the track. The two trucks lay waiting for assistance, which took a long time to come due to the muddy conditions. USAC had promised the drivers they would stop the race if vehicles got stuck due to the track conditions. However, it took them several laps to react to the incident and eventually stopped the race. By the time the track crews were able to get him out of the mud bank, Johnny was several laps down. Johnny worked his way back up to third not once, but twice—and back on the lead lap. Race officials confirmed that he was on the lead lap and in third to round out the podium. Unfortunately, at the conclusion of the race, Johnny was informed by USAC that he was still a lap down. Since many of the trucks had already left the race, Johnny still picked up a 4th place finish. Marty’s luck was not much better. He started from the second row and worked his way into the top 3 positions by lap number 2. Working hard and on the attack, he misjudged a jump and landed on the right rear wheel causing the track bar to break, ending his Pro-2 TORC series debut. With a number of trucks going out of the race, Marty still managed to earn the 7th points position. USAC has not made a decision on whether or not they would make up the missed races in the Pro-4 and Pro-2 classes. 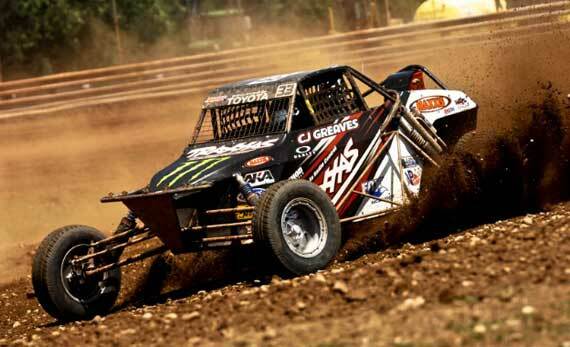 Johnny Greaves Motorsports will head to the more familiar grounds of Crandon International Raceway for the next rounds of TORC series action on June 18th and 19th. Temecula, CA (April 19, 2011)—The Johnny G Motorsports team of Johnny Greaves, Marty Hart and CJ Greaves headed to Speedworld Off Road Park in Surprise, AZ, for rounds 3 and 4 of the Lucas Off Road Racing Series this past weekend to mix it up with packed fields of drivers in their respective classes. All three drivers had strong showings and took their turns leading races, only to suffer mechanical problems that dashed their chances of taking their first wins of the season. Johnny Greaves, starting from the front row, punched his #16 Monster Energy/ ReadyLift/ GearUp2Go.com/ Maxxis Tire clad Toyota to the lead on lap one. He lead the entire Pro-4 class race on Saturday, only to suffer a fuel cell issue that dropped him out of the race with only 2 laps to go. Marty would have a similar fate. He also rolled his Maxxis Tires off from the front row of the Pro-2 class and dominated all the way to the closing laps. Hart, the reigning Pro Lite Champion, dominated the field through most of the race until a late race red flag temporarily stopped the race. Hart held off the pack as the laps wound down. It looked like he would claim his first Pro-2 victory, but contact with Rob MacCachren on the last lap took out his steering and he was unable to complete the lap. CJ Greaves ran in both the Pro Buggy and Super Lite classes. CJ, relying on his driving skills to make him competitive in this so called “arrive-and-drive” Super Lite class, kept his stock truck out of trouble in a race that was full of rollovers and full course cautions to take the 2nd place spot in Saturday’s race. He actually passed the leader in the closing laps but could not hold it and settled for the runner up podium. In his Buggy, CJ worked his #33 Traxxas/Oakley/Maxxis Tire machine as high as 4th after starting from the back of the pack. A miscue, about midway through the second half of the race, caused him to lose several positions. CJ made a late race charge to the front, but ran out of time and ended up in 7th. Sunday, brought new life and new hope, as the team hit the track with confidence knowing that their Toyota’s were dialed-in. Johnny Greaves proved he had the power by clocking the fastest qualifying time and earning the pole position. The excitement was short lived however. Johnny lost his power steering on the first lap of the race delivering him an early exit from the race. In the Pro-2 race, Marty Hart exploded out of the gate to a big lead at the drop of the green flag. The 20 truck “slam fest” began on the first lap. A dramatic end-over-end crash brought out a red flag race stoppage and complete restart of the race. Hart did not get as good of a jump on the restart and found himself in 4th. The race got crazy from that point on. Marty fought his way from 11th back to 4th several times with Bryce Menzies making heavy contact with the Hart machine. After 3/4 of the race, Marty’s battered truck succumbed to the damage from multiple collisions and he was again unable to finish the race. CJ ran his Pro Buggy in 5th most of the race on Sunday. A nagging shifting issue bothered him throughout the race. He was able to finish a respectable 9th in a class of experienced veteran drivers. In the Super Lite class, he diced his way into the number 2 position. While setting up his move to make the pass on the leader, he was hit from behind that sent him spinning into the in-field. He was unable to re-fire his machine and had to be pull started. He lost too many positions to recuperate and finished well back in the pack. While the team was disappointed in the outcome of the races, they were excited about the fact that they were showing a lot of improvement and proved that they had trucks that, along with a little luck, would be on the podium in the near future. Johnny G Motorsports continues to make preparations for the opening race of The Off Road Championship (TORC) series at Red Bud MX track East of Chicago in Buchanan, MI, May 28th-29th. Temecula, CA (March 21, 2011)—Johnny Greaves and Marty Hart loaded up and headed to Firebird International Raceway near Phoenix, AZ, for the Lucas series’ opening rounds of racing this past weekend. Johnny enters the 2011 season looking to write yet another chapter in his legendary Pro-4 career while Marty, also touting a highly successful career with more than 105 major victories, looked to perform well in his first time out in a Pro-2. The Lucas race was a great opportunity for the team to check out their respective Monster Energy Toyota Tundras and, like wearing a new pair of shows, see how the new MAXXIS tires would perform. Both experienced ups and downs throughout the weekend. Johnny, after suffering a flat tire on Saturday due to some contact, placed 9th in a field of 15 trucks. He was looking strong and led a number of laps in the first half of the race before the flat. On Sunday, he regrouped to take a close second place podium finish. Marty, while patiently feeling out the competition, managed to work his way up to fourth place in a field of 25 racers on Saturday, but had to leave the race late having suffered a mechanical problem. On Sunday, he relentlessly fought his way back to the front several times and ended the race with an impressive 5th place finish. CJ Greaves made a last minute appearance in the Super Lite class thanks to Speed Technologies, Super Lite and an extra vehicle. He knocked the cobwebs off in the Saturday race and pulled a 7th place finish out of a field of 14 trucks. On Sunday CJ qualified second. He got shuffled back in the field early in the race but his racing groove finally kicked in and he made a hard charge to the front. He made it as high as 2nd before he ran out of time but was glad to get on the podium for the first time this seasons. The Pro 4 Unlimited class took to the track first in Round 1 on Saturday. The field of 15 vehicles was a mixture of 4-wheel drive veterans and drivers several moving up from the Pro-2 and Pro Light classes. Johnny Greaves qualified his Monster Energy/Maxxis Toyota second. He started on the third row due to the 6 car inversion beside fellow Monster Energy/Toyota driver Rick Huseman. Johnny moved into the 3rd position by turn 3 and had the lead by the 3rd lap. As he began to stretch his lead, a crash brought out the caution flag that bunched everyone back together again. Adrian Cenni rear-ended Johnny delivering a flat rear tire to the Greaves machine. Johnny headed to the hot pit to change the tire which took him out of contention for a top spot. However he was still able to battle back to a 9th place finish. Up next, Marty Hart would make his debut in a Pro-2 truck. In qualifying on Friday, Marty did not push hard but wisely used the track time as a way to get used to the truck. He still qualified 8th out of a massive field of 25 trucks putting him on the 4th row after the inversion. When the green flag flew, he patiently sized up the competition before maneuvering his way up to as high as 4th place. With only 3 laps remaining, he landed hard and awkwardly off of one of the jumps, breaking the tie rod and taking him out of the race. Being the fierce competitor that he is, Marty was not especially happy with his performance but vowed to come back strong on Sunday. CJ Greaves went to Phoenix with the team and had not planned to race. But thanks to Speed Technologies and SuperLite and an extra vehicle, CJ made a last minute entry into the SuperLite class. After shaking the cobwebs off, he managed to qualify 4th on Friday. He worked his way up to 3rd position by the mandatory caution. At the restart, another racer caught him in the rear and he spun out. He battled back from the rear of the field, but ran out of time and squeezed out a 7th place finish. On Sunday, Johnny Greaves qualified second once again and started on row 2 with the 4 car inversion. When the races started, he quickly went to the lead. A bobble and some contact with the k-rail sent Greaves’ Toyota to the rear of the pack. In typical Greaves fashion, he began to slowly work his way back to through the field to the front and by the mid-race competition caution, he had made his way up to 3rd. When the racing resumed he picked-off Renezeder to take possession of the number 2 spot and went after the leader, Rick Huseman. With 2 laps to go, he caught Huseman. He tried several inside moves but was not able to make the pass, ending the race with the familiar Monster Energy/Toyota—1-2 punch. Marty Hart was eager to get back in the truck in round 2 and prove that he had the “heart” to take on the 25 Pro-2 trucks. He basically “drove the wheels off the truck,” having to come from the back of the pack to the front on multiple occasions. Marty reached as high as 4th when he tangled with Carl Renezeder, dropping him back several positions. He would battle back, only to have other track incidences send him backwards once again. When the dust settled, Marty had recorded an impressive 5th place finish. Johnny G Motorsports will head back to the Midwest in preparation for The Traxxas TORC Series season which kicks-off on April 30th in Cycle Ranch in Floresville, Texas. You can follow all the action on the team’s website: JohnnyGreaves.com.